L. Stubblefield needed to get 746 hogs to market in the dead of winter, so he embarked on a hog drive from Hunters, Washington, to Davenport. Stubblefield, a Tonasket hog-buyer, said he decided to undertake this mid-January hog drive because there was no other viable way to get his product to a railhead. He had driven hogs to market many times before, but never through 3 feet of snow. He said he assembled a team of 10 hog drivers, two sleigh drivers and a snowplow driver. The snowplow driver went in front of the hogs to break trail. At first, the hogs were wary of the whole endeavor, but after an hour or two of urging by the hog drivers, the hogs finally entered into the spirit. This grand oinking procession sometimes stretched out for 3 miles on snowy roads. The two sleighs picked up stragglers. The temperature reached 11 below, so Stubblefield called ahead to each stop and arranged to have straw, a foot deep, laid down for bedding. He said at night the hogs packed together tightly, “with only their noses” sticking out of the straw. 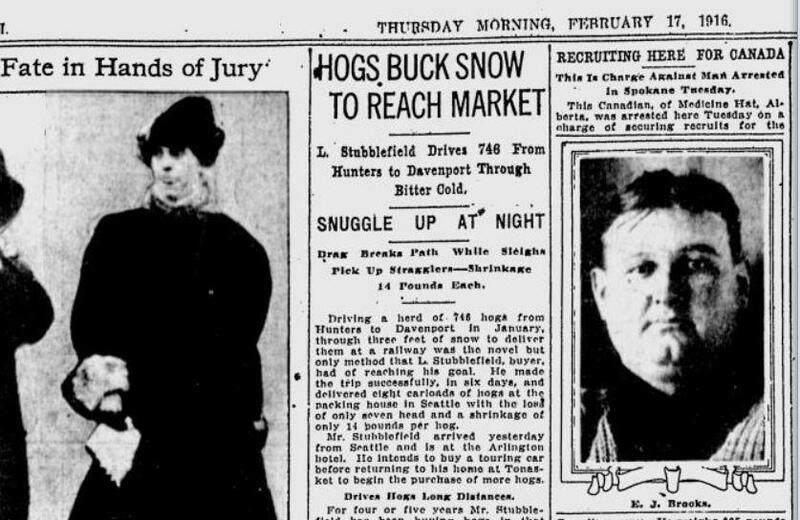 Stubblefield was gratified to say that he lost only seven hogs over the entire six-day ordeal, and “the shrinkage rate” was only 14 pounds per hog. The hogs were put on railcars at Davenport, and Stubblefield accompanied them to Seattle, where they fetched $7.10 per 100 pounds.